I live in awe of your talent. Absolutely gorgeous. Ah ha! Thats why you were practicing your fabric! Its beautiful! 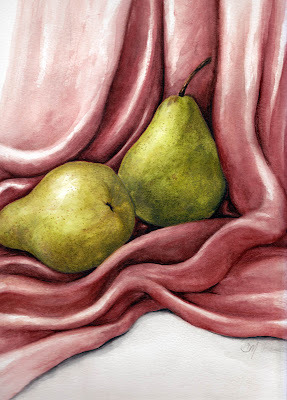 the soft, sensuous waves of the fabric go so well with the shape of the pears! Nice painting! Elegant and beautiful. As always, so well done.